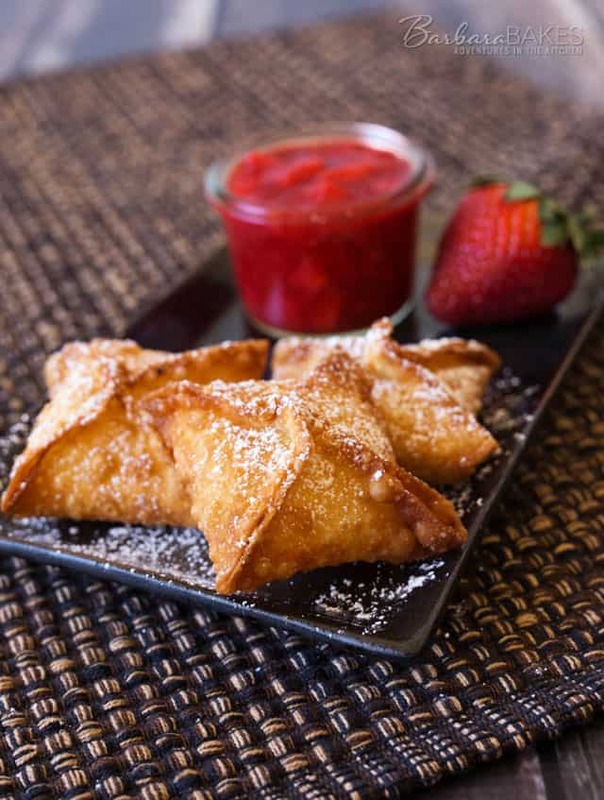 Strawberry Cheesecake Wontons with a cheesecake filling deep fried until they’re golden brown and crispy, then served with a sweet, fresh strawberry sauce. When we go out for Chinese food, I often order cream cheese wontons for an appetizer. They’re generally served with a sweet orange sauce, and I some times wonder why they aren’t served for dessert. So when I signed up to bring dessert for this month’s Asian Feast virtual progressive dinner, I decided I would serve wontons for dessert. 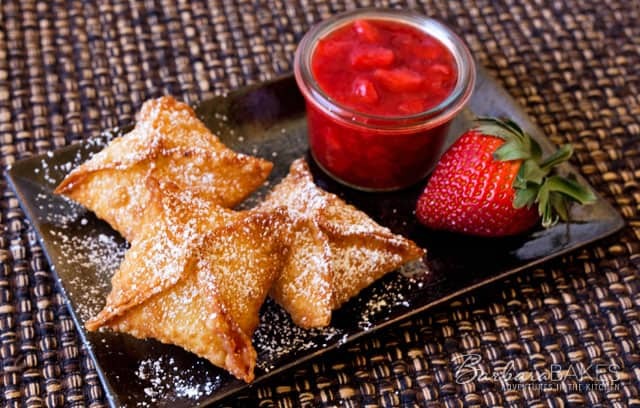 I started with my popular Strawberry Cheesecake recipe and transformed it in to Strawberry Cheesecake Wontons. I don’t often fry foods at home, but if you want to get a crispy, restaurant-style wonton, you’ve got to fry them. The recipe makes thirty wontons, but these are so crispy, sweet and delicious that thirty may not be enough. Prepare Strawberry Sauce: Add thawed strawberries and water to a small saucepan. In a small bowl, mix together sugar and cornstarch; add to saucepan and stir until dissolved. Bring to a boil over medium high heat, stirring constantly. Continue cooking and stirring until thickened and clear. Add a drop of red food coloring, if using. Pour cooked strawberry mixture over diced strawberries in a mixing bowl, and stir to combine. Cheesecake Filling: In a mixing bowl, beat together the cream cheese, sugar, and flour until smooth. Beat in the egg, sour cream, and vanilla just until blended. Create egg wash: In a small mixing bowl, whisk together 1/2 cup water and 1 egg. Assemble the wontons: Place wrapper on a work surface. Dip a finger in the egg wash, and paint all 4 edges with the wash. Spoon 2 teaspoons of the cheesecake mixture into the center of the wrapper. Bring the corners of the wonton together to the center and pinch together to form an "X"; pinch the edges to seal. 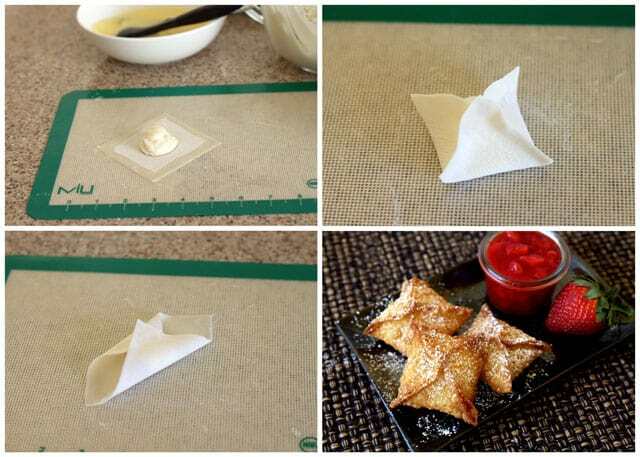 Place folded wonton on a Silpat or parchment lined baking sheet and cover with plastic wrap to avoid drying out. Repeat with remaining wrappers. Frying wontons: Add 1 1/2 inches of vegetable oil to a large wok or deep pot. Heat the oil to 375°. Add five wontons at a time to the oil and fry, turning occasionally until they are golden brown. Remove to a baking sheet lined with paper towels to drain excess oil. Welcome to Progressive Eats, our virtual version of a Progressive Dinner Party. This month’s theme is Asian Feast and is hosted by Jeanette Chen who blogs at Jeanette’s Healthy Living. Join us and make something unique and delicious! I want to serve them for a dinner party but I don’t want my house to smell like oil? Hi Melanie – ideally, you want to serve them as soon as possible after they are fried. If you have a hot plate, or a side burner on your barbecue, you could cook them outside. I’ve never tried a dessert or sweet flavoured wontons before – this is something I must make! These are adorable – the things that can be made with wonton wrappers (in addition to traditional wontons) is so wonderful, and I think this is the first dessert item I’ve seen. The whole dinner party looks pretty scrumptious! These do look sooo delicious. Pinning and tweeting. Really nice idea to make cream cheese filling and strawberry sauce!